For just the third time, Jackson’s MMA Series will be making its way up to Pueblo, Colorado when the 18th installment of the series hits the Pueblo Convention Center on April 1. 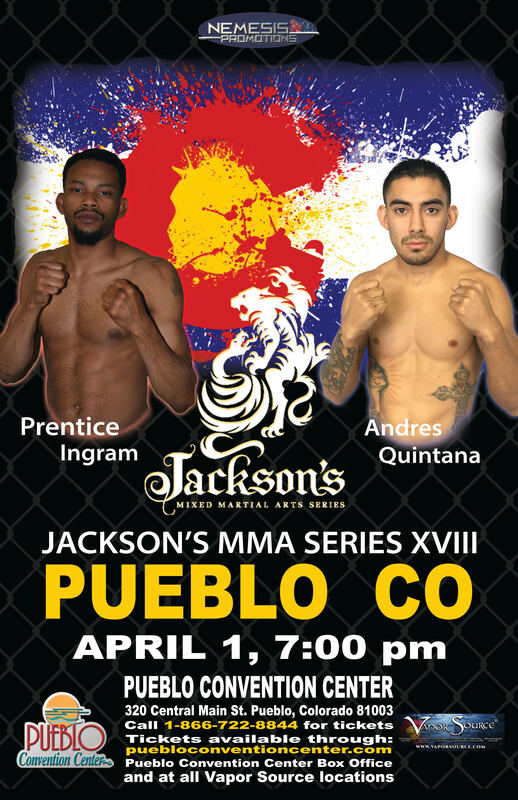 The main event for Jackson’s MMA Series 18 will feature hometown fighter Prentice Ingram against up and coming prospect Andres Quintana of Albuquerque in a featherweight bout. Ingram (7-6), has recently spent time training between Jackson’s-Wink MMA Academy in Albuquerque and Rude Effex Fight Team in Pueblo. Quintana (9-1), fighting out of Albuquerque’s Luttrell-Yee MMA, a former participant of the The Ultimate Fighter 22, will be fighting in just his second bout in 17 months. Also expected to be on the card is Albuquerque fighter Javier Palacios against an opponent to be named. Tickets are now available and can be purchased at the Pueblo Convention Center, online at PuebloConventionCenter.com, or by calling 1-866-722-8844.